BY LINCOLN ANDERSON | Updated Oct. 26, 4:45 p.m.: More than 200 people packed a hotly anticipated hearing on the Small Business Jobs Survival Act at City Hall Monday. Scores of people signed up to testify on the issue, and the hearing turned into a marathon, lasting more than eight hours. 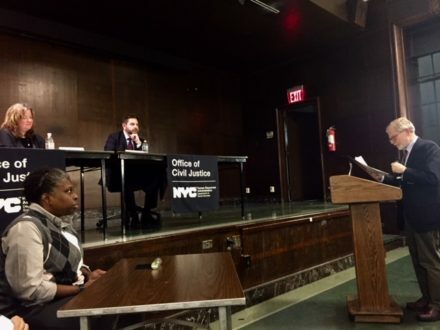 Among some of the main takeaways were that it became clear the de Blasio administration does not support the S.B.J.S.A., and that, according to City Council Speaker Corey Johnson and others, the bill should not be O.K.’d as is, and needs some modifications. The hearing also saw a testy exchange between Johnson and John Banks, president of the powerful Real Estate Board of New York, which has long been accused of working behind the scenes to keep the bill from ever coming up for a vote. Banks said the bill would “stifle” economic activity and deprive property owners of their rights. REBNY, among others, is expected to sue if the Council passes the bill and it is not vetoed by de Blasio. Former Manhattan Borough President Ruth Messinger was on hand to testify in support of the legislation — currently known as Intro. 737A — which she originally introduced when she was an Upper West Side city councilmember. Advocates for the act in the audience frequently would silently flutter their hands over their heads — a permitted form of displaying support — at statements backing the bill or small merchants. Council security staff quickly greeted any applause or cheering with rebukes not to interrupt the hearing. Meanwhile, about 50 representatives of business improvement districts a.k.a. BIDs and others against the bill sat in the audience wearing blue baseball caps sporting the slogan “Vote No on Commercial Rent Control” on their fronts. The group also included commercial real estate brokers and representatives of residential co-ops and condos. The S.B.J.S.A. has languished in the City Council for three decades. The measure would address what advocates say is the biggest hurdle facing mom-and-pop shops — the lease-renewal process. When leases expire, landlords, especially in gentrified Manhattan, typically jack up the rents to levels that current tenants can no longer afford. Seventy-five business improvement districts, or BIDs, across the city oppose the bill. Their members were among a group of about 50 people wearing blue “No Commercial Rent Control” caps at the hearing. However, for a merchant with an expiring lease, the S.B.J.S.A. would mandate mediation with the landlord and then, if needed, binding arbitration to reach agreement on a 10-year lease renewal. Shortly after being elected the Council’s speaker earlier this year, Johnson pledged that he would hold a hearing on the long-snubbed bill. Yet, at the same time, he warned that the S.B.J.S.A. was “not a silver bullet,” in his opinion, and that an array of other strategies would also be needed to help small businesses survive. Despite suffering from a bad chest cold — that sometimes saw him loudly coughing on the dais — Johnson sat through about four-and-a-half hours of Monday’s hearing, which was chaired by Mark Gjonaj, head of the Council’s Small Business Committee. “When a longtime business is shuttered, we lose a piece of New York,” Johnson said. Small businesses help make New York more livable in many ways, he noted, from providing essential services, like shoe repairs, to holding packages and mail for residential neighbors. He and other councilmembers also warned of potential “unintended consequences” of the S.B.J.S.A. Former Borough President Ruth Messinger introduced the first version of the S.B.J.S.A. around 30 years ago when she was a city councilmember. Gregg Bishop, the commissioner of the city’s Department of Small Business Services, made it clear that the de Blasio administration has issues with the S.B.J.S.A. Bishop said that because landlords often have more resources than their tenants, the arbitration process would not be fair. He also wondered if New York would have “enough arbitrators” to handle all the lease-renewal cases. 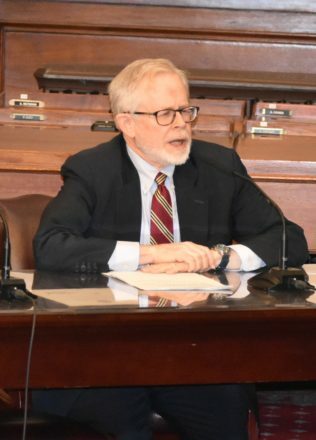 But Assemblymember Richard Gottfried, in his testimony later on, said the situation already is unfair toward the tenants and could not possibly be worsened by the S.B.J.S.A. State Senator Brad Hoylman held out his report, “Bleaker on Bleecker,” which detailed the crisis of empty storefronts on the famed Village strip. Johnson and others took issue with the fact that the bill would cover all commercial tenants in New York City — including not just ground-floor storefronts, but upper floors occupied by financial firms and white-shoe law firms. As one speaker put it, “shopping malls” would even be covered by the S.B.J.S.A. Johnson repeatedly brought up the example of Tortilla Flats, the long-running and beloved far West Village bar and restaurant, that sadly is closing on Sat., Oct. 27, due to high rent. “It just came out in the last two days that they are closing,” Johnson said. “Clayworks pottery was forced out of its spot in the East Village after 44 years,” he said, referring to another store that closed a year ago due to an unaffordable rent. John Banks, president of the Real Estate Board of New York, said that the S.B.J.S.A. would “stifle” economic activity. “The Associated Supermarket on 14th St. and Eighth Ave., one of the last affordable supermarkets in the Village — they tripled their rent, and that store is still empty,” Johnson said. It was also noted that McNally Jackson, the independent bookstore on Prince St. in the Little Italy area, is being forced to leave its space. Bishop didn’t have any ready answers on dealing with escalating rents. The S.B.S. commissioner did say that the department is open to the idea of a tax on storefronts that are left vacant too long — an idea endorsed by the mayor — and also of creating a “storefront registry,” to quantify how many empty stores there are around the city. Jessica Lappin, a former Upper East Side councilmember, now president of the Downtown Alliance, said the retail landscape of her Lower Manhattan BID’s district has benefitted from flexibility, but that the S.B.J.S.A. would potentially lock commercial tenants in place for decades. City Council Speaker Corey Johnson, right, spoke extensively during the hearing, which was chaired by Councilmember Mark Gjonaj, next to Johnson. Jessica Walker, president of the Manhattan Chamber of Commerce, noted that online retail is really hurting bricks-and-mortar stores — currently gobbling up about 10 percent of all purchases — and will only grab more of the market in the years to come. She predicted some landlords would respond to the S.B.J.S.A. by simply not renting to small merchants. Similarly, Bishop, of S.B.S., said landlords could just choose not to rent their spaces to anyone if they felt they were being forced to lowball potential rents. Walker said pressing problems that the city should address instead are high commercial rent taxes and property taxes. David Eisenbach, head of Friends of S.B.J.S.A., told the councilmembers he would be O.K. with cutting white-shoe law firms and such out of the bill’s protections, but that other tenants “on the second floor” — like yoga studios and dentists offices — need the bill’s protections. A Columbia professor, Eisenbach is running for public advocate, with the S.B.J.S.A. being one of his main campaign planks. But others who have been advocating for the bill longer — in some cases, for decades — boycotted the hearing, slamming it as “a sham.” Eisenbach led a rally at noon before the hearing, touting the bill. The group Community Control of Land Use New York held its own rally at 10 a.m. organized by Chelsea activist Marni Halasa. CCLUNY, as she explained it, is a group she founded after she ran for City Council “to educate small businesses and the public on the S.B.J.S.A. and organize activists, businesses and tenants to have a greater voice in land use decisions.” Joining that rally was Steve Barrison, of the Small Business Congress, whose members have angrily been predicting that Johnson and the Small Business Committee would “water down” the bill. The Greenwich Village Society for Historic Preservation supports the S.B.J.S.A., as its executive director, Andrew Berman, made clear at the City Council hearing. Meanwhile, members of Barrison’s S.B.C. don’t trust Eisenbach and his group. But Eisenbach says he is “playing the inside game” while the others have relegated themselves to being on “the outside” by publicly predicting Johnson will neuter the bill. The Council speaker asserted that he is sincere in pushing the legislation. Advocates say the strategy of REBNY and others is to confuse the S.B.J.S.A. with commercial rent control, which would standardize commercial rent increases across the city. Some advocates had pushed in vain for the Council’s Legal Department to issue an opinion prior to the hearing that the bill is fully legal. But that is not usually done in the Council, and it didn’t happen this time either. As Jaime McShane, REBNY’s senior vice president for communications, noted as he watched the proceedings, the Council leadership wouldn’t introduce a bill if they didn’t feel it was legal. As for what happens next, Johnson explained, the bill will now undergo modifications by the Council’s Legal Department. The Villager asked for a time line of what will happen next — such as when the Council might vote on a modified bill — but a City Council spokesperson only responded in general terms. All of New York City’s whopping 5,500 authorized food carts and trucks will be required to post their grade. The Health Department plans to attach location-sharing devices on each unit in order to keep track of when a vendor is due for inspection. To prep for the roll-out, the Health Department will be hosting food safety education workshops for mobile food vendors. The classes will acclimate vendors to the grading program, a refresher of food handling and common food safety violations that are easily avoided. According to the department’s website, the schedule of Spring classes will be posted in early 2019. Bushwick Daily will continue to report on how this will potentially affect Bushwick’s many food vendors. The temperature, like the chicken being grilled, was sizzling — but the mood was buoyant at the annual National Night Out Against Crime on Tues., Aug. 7. The event — a way for the police and the community to come together — was held locally by Chelsea’s 10th Precinct, and took place at the Fulton Houses on W. 17th St., between Ninth and 10th Aves. On May 17, Nixon brought her battle for governorship to Chelsea by seeking an endorsement from the Chelsea Reform Democratic Club (CRDC). The bout was witnessed by a crowd who packed the Hudson Guild’s John Lovejoy Elliott Center (441 W. 26th St.), and there was much buzz before Nixon’s arrival. The CRDC is celebrating its 60th year of political activism that has helped shape Chelsea to be one of the most compassionate, diverse, and exciting places in the world — and its members take endorsement voting very seriously. Nixon faced off against New York State Assemblymember Richard Gottfried (Assembly District 75), representing the corner of Governor Andrew Cuomo. As the specter of empty storefronts continues to haunt the city, Mayor Bill de Blasio’s floating of a possible penalty for landlords who leave properties vacant for long periods of time has been greeted by elected officials and advocates as an encouraging sign. “I’m heartened [by] City Hall’s attention to the issue and the mayor’s personal interest,” State Senator Brad Hoylman said in a phone interview late last week. A growing number of restaurants across the country — like test locations for Starbucks and Shake Shack and the entire Sweetgreen, Dos Toros and Tender Greens chains — are no longer accepting cash. It’s all plastic all the time. The stores believe not dealing with cash helps move the line of customers faster. Most people pay for their meals with a credit card anyway, the chains argue. Plus, counting the cash at the end of the day is a waste of time. But the war on cash has sparked a backlash. State lawmakers, a civil rights group, the National Retail Federation and a company servicing ATMs are all pushing back against the trend, claiming that refusing the greenback — on which the US Treasury writes “This note is legal tender for all debts, public and private” — is simply un-American. “I think Americans ought to have a right to pay with cash,” New York state Assemblyman Richard Gottfried told The Post. The Manhattan lawmaker circulated a memo on Tuesday to his colleagues proposing legislation requiring New York businesses to accept cash.